Gases are everywhere. You may have heard about the atmosphere. The atmosphere is an envelope of gases that surrounds the Earth. In solids, atoms and molecules are compact and close together. Liquids have atoms that are spread out a little more. The molecules in gases are really spread out, full of energy, and constantly moving around in random ways. What is another physical characteristic of gases? 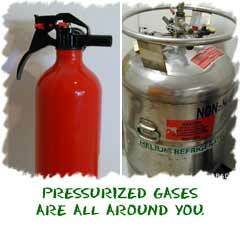 Gases can fill a container of any size or shape. It doesn't matter how big the container is. The molecules spread out to fill the whole space equally. Think about a balloon. No matter what shape you make the balloon, it will be evenly filled with the gas molecules. Even if you make a balloon animal, the molecules are spread equally throughout the entire shape. Liquids can only fill the bottom of a container, while gases can fill it entirely. The shape of liquids is very dependent on gravity, while less dense gases are light enough to have a more freedom to move. You might hear the term "vapor." Vapor and gas mean the same thing. The word vapor is used to describe gases that are usually liquids at room temperature. Good examples of these types of liquids include water (H2O) and mercury (Hg). They get the vapor title when they are in a gaseous phase. 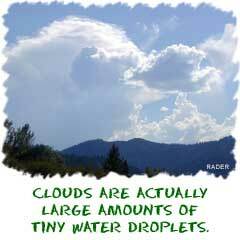 You will probably hear the term “water vapor” which means water in a gas state. Compounds such as carbon dioxide (CO2) are usually gases at room temperature. Scientists will rarely talk about carbon dioxide vapor. Gases hold huge amounts of energy and their molecules are spread out as much as possible. When compared to solids or liquids, those spread out gaseous systems can be compressed with very little effort. Scientists and engineers use that physical trait all of the time. Combinations of increased pressure and decreased temperature force gases into containers that we use every day. You might have compressed air in a spray bottle or feel the carbon dioxide rush out of a can of soda. Those are both examples of gas forced into a smaller space at greater pressure. As soon as the gas is introduced to an environment with a lower pressure, it rushes out of the container. The gas molecules move from an area of high pressure to one of low pressure.